Our custom made indoor car covers are individually hand made to order from a thick cotton acrylic with a soft fleece inner. 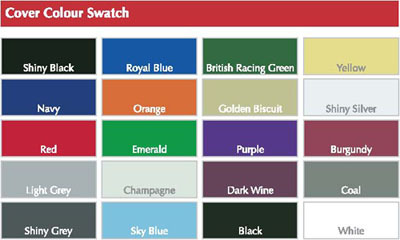 They are fully breathable and are available in a choice of 20 colours for the cover and piping. Hand made and fully tailored to the car. Protects against fine dust, dampness, knock and scrapes. All covers are available with contrasting piping and combination of colours. As supplied to many manufactures and collector around the world. Supplies with Classic Additions duffle bag.